From Passion 2007, held in Atlanta, Georgia. This is Chris Tomlin (and others) leading Amazing Grace (My Chains Are Gone)... Each word is so poignant- so true. Hallelujah to the Lamb of God, the Lord of all glory, Jesus the Messiah! We are excited to announce the launching of our new ministry website, psalm45publications.com. From this page, you may access all of my books, and either download them electronically, browse chapter-by-chapter, or purchase print copies. In addition, you will find hundreds of Christ-centered articles, teaching outlines, book reviews, categorized and annotated scripture lists designed for reference and guided studies, poems, "theological FAQs," and other similar items. Also, you can keep up-to-date on my latest posts by scrolling down to the "recent articles" section on the home page. Many thanks to Matthew Fitzsimmons for all the work he contributed toward designing a simple, attractive, and easy-to-use website. Psalm 45 Publications exists to disseminate Christ-centered and gospel-saturated literature as freely and widely as possible, so please make free use of any of the resources you find. Everything on the site is available for free download, and print copies of most of the items are available to purchase at a reasonable price -- but if you would benefit from having something in print and cannot afford to purchase it, send me an e-mail and I'll try to get it into your hands. The only thing I would request in return is that, if you find something to be useful for stirring up your love of the Savior or strengthening your theological understanding or Christian walk, you would spread the news to others who might also benefit. In order thereto, please feel free to e-mail this to friends, link to or blog about psalm45publications.com, or spread the news in any other way you see fit. P.S. We are still ironing out a few things such as the "reference only Scripture lists" and links on the sidebar. These last couple of weeks there were many major updates on Monergism.com including the following categories: Postmodernism, eccelsiology, leadership, Resources on 1 Thessalonians, 2 Thessalonians, 1 Timothy, 2 Timothy, Titus, Hebrews (606 links), hermeneutics and guidance. In each of these categories we have mined and gathered the most Christ-honoring materials from around the web and made it available to you free all in one place. Dr. James White's web site has just been given a face-lift of sorts. It amounts to a major upgrade for a site that is well known for its defense of the biblical Gospel, found here. This is a list of resources that Intown Presbyterian Church (PCA) Portland believes are helpful for a given area of study. None of these resources are exhaustive; much more could be said about the topic. However, these books stand out because they are clear, concise, and rely upon a good bibliography that can take you deeper. Here is a MUST READ: Commenting on whether Calvinists are saved, in his own words, here is Dave Hunt at his best, apparently unconcerned for historical and theological accuracy, throwing all caution to the wind. Read through it -- no further commentary necessary. Question [composite of several]: Was this a misstatement, or do you really believe what you said in your September Q&A: â€œThose who only know the false gospel of Calvinism are not savedâ€? Answer: The original question was, â€œIs it possible for someone who believes only in the soteriology of Calvin to be saved?â€ As I said in my response, there are many Calvinists who were saved before they became Calvinists or who have believed the true gospel in spite of their Calvinismâ€”but â€œthose who know only the false gospel of Calvinism are not saved.â€ If all one believes is that infant baptism saves, as Calvin taught (and which is the case with many Calvinists), one is certainly not saved. If a person believes that he was saved through infant baptism, how is it possible for him, without relinquishing that false belief, to truly be saved by believing the gospel? He has no need of the true gospel, having already been forgiven his sins and made a child of God through infant baptism. He may affirm at his confirmation that Christ died for his sins, but he still believes that the benefit of that sacrifice came to him through infant baptism long before his â€œconfirmationâ€ of this lie. How could that false faith save? If it does, then the many former Catholics, Lutherans, and Presbyterians who realized they werenâ€™t saved through their infant baptism, and who put their faith in Christ, were born again, and then baptized as believers, have been deluded. But they would vehemently deny that they were saved all the time in spite of their faith in infant baptism! And they would reject Calvin himself as an â€œex-Catholicâ€â€”because he continued to rely upon his infant baptism for salvation, he declared that being baptized as a baby was the sure way of knowing one was among the elect, he opposed those who got saved and were then baptized, he banned Anabaptists from Geneva in 1537, and he even had some burned at the stake for this belief. 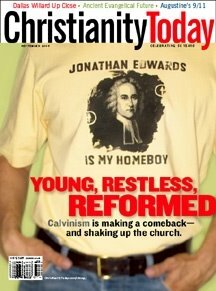 "Young, Restless, and Reformed: Calvinism is making a comeback--and shaking up the church. "Christianity Today's cover story in the latest issue, shipping this week. Justin Taylor over at Betwen Two Worlds mentioned that the cover story article was written by Collin Hansen, and that it is an excellent piece that profiles the Reformed resurgence in the twenty-something crowd. John Piper, Al Mohler, Joshua Harris, Kent Hughes, C.J. Mahaney, and Together for the Gospel are all mentioned. Pick up a copy of the magazine at your local bookstore. We will also link to the story when it appears online next week. In his book "A Generous Orthodoxy", when speaking of the doctrine of unconditional election, Brian McLaren in an attempt to redefine TULIP, asserts that anyone who believes in a God who elects some and not others to eternal life (1 Peter 1:2) must be so self-absorbed in their standing before God that they view themselves as having what he calls â€œexclusive privilegeâ€ over others. It can be demonstrated, on the contrary, that the divine intent of revealing the the doctrine of election to us in Scripture was actually to bring about the opposite effect. Understood rightly, our election in Christ safeguards the biblical axiom that our salvation is by the grace of Jesus Christ, and by that grace ALONE ... that salvation is wholly, not partly, procured by Jesus Christ and our being united to Him by His Holy Spirit. Paul thus defines a Christian as one who worships in the Spirit of God, glories in Christ Jesus and has no confidence in the flesh (Phil 3). A Tale of Two Mediators In MP3 or Streaming Audio. Are we considered guilty for Adam's sin? What is the doctrine of original sin? Continuing their study of Romans 5, the hosts contrast the roles of two mediators, Adam and Christ, in order to better understand sin and grace. Tune in to this episode of the Romans Revolution on the White Horse Inn. Please take the time to listen to this VERY HELPFUL conversation with Michael Horton and Kim Riddlebarger (and others). Also, be amazed at lack of persons at a National Evangelical Pastors Conference who actually believe in original sin at all. Most of them would be brought up on charges of rank heresy if any historic church councils made any difference. If imputation of guilt is unjust as many said, then would they believe that God imputing our guilt to Jesus is also unjust??? DVD Review - Marks of a Cult by Tim Challies New Recommendation! Why are Baptists properly considered Christians, but Mormons are not? Why is the Jehovah's Witness religion classified as an anti-Christian cult while Presbyterians, Wesleyans and Pentecostals are simply seen as denominations within the Christian faith? How does one differentiate between true Biblical Christianity and an aberrant religious movement? And just what are the marks of a cult? Preaching as Expository Exultation for the Glory of God by John Piper--delivered at the Together for the Gospel Conference. There are four parts to this message. First, I will reflect on the kind of preaching that I long to see God raise up in our dayâ€”the kind that is shaped by the weight of the glory of God. Second, I will try to portray the glory of God which affects preaching this way. Third, I will offer my biblical understanding of how people waken to this glory and are changed by it. Finally, I will explain how all of this calls for a kind of preaching that I call expository exultation. A simple, isolated statement about belief in scriptural authority is not enough on its own to distinguish Protestants from Catholics. Augustine legitimated mediocre Christianity of a kind that accepted failure as failure and then pointed to Godâ€™s grace in Christ as the only basis for salvation, whether at the start of the Christian life or at the end. Thus, the failure of Pelagius to make sense of Paulâ€™s teaching on fallen human nature and grace led to Augustineâ€™s enshrinement of failure as one of the hallmarks of the true Christian. And that is surely good news. repentance toward God and faith in the Lord Jesus Christ. Repentance and faith are inseparable experiences of grace. Repentance is a genuine turning from sin toward God. Faith is the acceptance of Jesus Christ and commitment of the entire personality to Him as Lord and Saviour. Justification is Godâ€™s gracious and full acquittal upon principles of His righteousness of all sinners who repent and believe in Christ. Justification brings the believer into a relationship of peace and favor with God. As many of you already know, we need to raise $5000.00 to cover the costs of a major upgrade to Monergism.com. This project is seeking your help to fund the cost of backend engineering, design, data entry as well as continued regular maintenance costs for the site (software, hardware, etc.). Monergism.com's content will be put into a database with consideration to usability, navigation and website architecture. When the project is complete, the goal is a much better user experience and to make it easier for visitors to find what they are looking for. While the content of the site will continue to be focused on Christ-honoring theology, it should be much more streamlined and accessible. We thank the Lord for all of you that after only one week we have already raised over $4000.00 in donations through checks and PayPal. We are really thankful to see the broad support and the obvious hand of the Lord at work through you in furthering the Gospel through Monergism.com. As most of you already know, the Together for the Gospel Conference is taking place this week, finishing later today. Tim Challies is serving many of us who are not there (but would like to be) by live blogging at the main sessions. Here are his notes for Dr. Sproul's session yesterday afternoon. For more, go to www.challies.com. This afternoon we have the privilege of hearing R.C. Sproul speak on "The Center of Christian Preaching: Justification by Faith Alone." It seems to me that if we could want to hear any man in the world today speak on the subject of "justification by faith alone," it would be Sproul. Few men have dedicated more time to understanding and preaching this critical doctrine. Few men are more qualified to speak to share with us this: the very heart of Christian doctrine. Justification is the doctrine upon which the church stands or falls, and ultimately, the doctrine upon which you and I stand or fall. This doctrine is the "Atlas" upon which the whole of Christianity rests. Were Atlas to shrug, the entire structure of the Christian faith would fall to the ground and be shattered. This is not a common understanding of the doctrine of justification by faith alone in our day. It is now considered, tragically, the small print of the gospel. The battle over justification by faith alone is considered, by so many, a tempest in a teapot. Many have declared the Reformation to be over since Catholicism and Protestantism have supposedly mended their fences and now stand together. The New Perspective tells us that both sides completely misunderstood Paul's true teaching on justification. Yet it should not be surprising that we see a minimalist attitude being expressed about this doctrine. Towards the end of his life, Martin Luther warned (rightly it seems) that in every generation the gospel will have to be reaffirmed because this doctrine, when proclaimed boldly and accurately, will produce conflict. We are those who, when faced with the options of fight or flight, prefer to flee conflict even if the stakes are as low as being burned not at the stake but at the payroll of a local church. With this increasing significance comes an eclipse of the understanding of this doctrine. Dr. Sproul will discuss the Roman Catholic understanding of the doctrine of justification so we can understand the Reformation understanding up against the Roman Catholic. 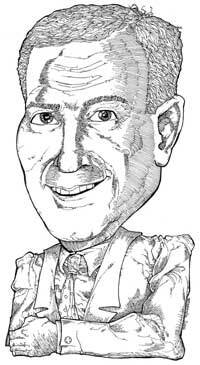 Meet J. Ligon Duncan III, the newest member of the Hall of Contemporary Reformers. Dr. Duncan calls himself a Westminster Calvinist and has, what he calls, an an ordinary means grace-based ministry which believes that God means what he says in the Bible about the central importance of these public, outward instruments for spiritual life and growth. God explicitly instructs ministers and churches to do the following things: (1) "give attention to the public reading of Scripture, to exhortation and teaching" (I Timothy 3:13); (2) "preach the word; be ready in season and out of season; reprove, rebuke, exhort, with great patience and instruction" (2 Timothy 4:2); (3) "make disciples of all the nations, baptizing them in the name of the Father and the Son and the Holy Spirit, teaching them to observe all that I commanded you" (Matthew 28:19); (4) "This is My body, which is for you; ...This cup is the new covenant in My blood; do this, as often as you drink it, in remembrance of Me. For as often as you eat this bread and drink the cup, you proclaim the Lord's death until He comes" (I Corinthians 11 :24-26); (5) "I urge that entreaties and prayers, petitions and thanksgivings, be made. ..Therefore I want the men in every place to pray, lifting up holy hands" (I Timothy 2:1, 8). These are the main ways God's people grow. We are saved by grace through faith, faith alone in Christ alone. But the instruments, the tools of God' s grace to bring us to faith and grow us in grace are the Word, prayer and sacraments. Nothing else we do in the church's program should detract from these central instruments of grace, and indeed every thing else we do should promote and coalesce with them. 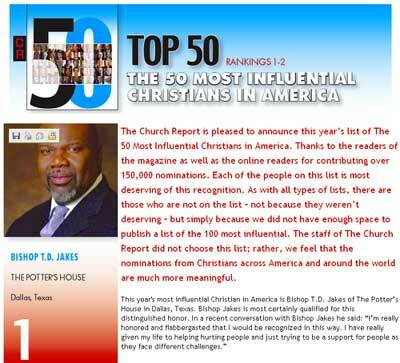 According to The Magazine for Church Business Administrators and Para Church Executives: The Church Report - The 50 Most Influential Christians in America has voted T.D. Jakes (a non-Trinitarian modalist) and Joel Osteen (whose books and preaching are merely pep talks that are completely void of the gospel) in their #1 and #2 positions. The top 10 also includes Rick Warren, Bill Hybels, Paul Crouch and Joyce Meyer. The list was derived from over 150,000 nominations from its readers. While there are a couple of notable names down the list, the lack of discernment among evangelicals as to what constitutes the gospel and historic orthodox Christianity is made evident by many of the questionable selections. Instead of despairing, this should bring us to prayer that the Lord would move within our leadership our rank and file to desire God-honoring, Christ-centered, gospel-driven churches. That He woud send his Spirit to open our eyes and circumcize our hearts to to embrace a full-orbed Trinitarian gospel that preaches the whole counsel of Scripture among all our leaders and churches. If this current trend continues in America, our days are numbered but God, who can bring life out of death hears our prayers. The situation being this critical means that we must pray to the Lord for His mercy. Perhaps the greatest task facing us is the re-evangelization of the Church itself. Four veterans go a few rounds on the subject of cooperation among evangelicals & their churches. Listen to Mark Dever, Al Mohler, Ligon Duncan and CJ Mahaney talk about where they can and cannot cooperate as church leaders. Mark writes, â€œThis is one of my favorite conversations we've been able to record. We had already been together for several hours and the conversation just flowed." Two baptists, one Presbyterian and a Reformed Charismatic discuss the pratical implications of unity when people are coming from different distinctives. John Frame: Doctrine of the Christian Life the third volume of his Theology of Lordship series can read in its entirety online for free. With the recent publication of David Wellsâ€™ Above All Earthly Powers: Christ in a Postmodern World (Eerdmans, 2005), the editor (Derek Thomas) asked three Alliance Council members, Ligon Duncan, Phil Ryken, and Carl Trueman to engage in a round-table discussion on the importance of this and his previous volumes. Take the time to see the updated and most extensive resource of the Doctrine of the Bible on the Internet @ Monergism.com. A cornucopia of theologically sound essays. 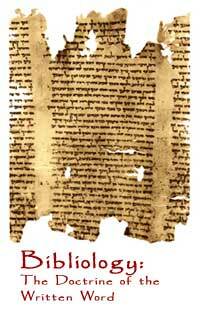 â€œSince for unbelieving men religion seems to stand by opinion alone, they, in order not to believe anything foolishly or lightly, both wish and demand rational proof that Moses and the prophets spoke divinely. But I reply: the testimony of the Spirit is more excellent than all reason. For as God alone is a fit witness of himself in his Word, so also the Word will not find acceptance in men's hearts before it is sealed by the inward testimony of the Spirit. The same Spirit, therefore, who has spoken through the mouths of the prophets must penetrate into our hearts to persuade us that they faithfully proclaimed what had been divinely commanded ... "
--John Calvin, Institutes of the Christian Religion 1.7.5.